The article solves the problem of increasing the functioning efficiency of rice irrigation systems which are complicated technical and ecology-economical objects, demands complicated and systematic decisions approaches, first of all, their systemic optimization and water — energy usage on ecology-economical basis. Object of this work is aimed at increasing the general functioning efficiency of rice irrigation systems based on the general theory optimization further development of their water and energy usage on ecology-economical basis. Research methods. Scientific researches were based on the theoretical and experimental methods and also on the information database embracing the period of 1966-2016. The researches were performed on the Danube Rice Irrigation Systems which are located in the Danube estuary Odessa region. Research results. On the RIS water and energy usage optimization firstly corresponds to flush water mode or to corresponding filtration parameters using surface flooding. Creation and sustentation of minimum required flushing level on the irrigated saline soils due to watering filtration is the main feature and necessary condition of existing rice irrigation systems functioning efficiency. As we know, on the RIS there is the functioning connection among its components: effect, mode (regime), technology and construction, the systemic optimization reflects consequent justification of the mode optimal parameters, water usage technology, construction’s parameters and its elements. The above presented ecology-reclamation approach is based on the ecology reliability index, optimal parameters of vertical speed filtration which were determinedin the following way: 6-10 mm/d/n. Calculations concerning the definition of the optimal technological parameters based on economic criteria of RIS functioning efficiency showed that optimal rice quota in the crop rotation equals 50-60% and optimal from the point of view of receiving net profit is 18 th.m3/ha. Based on the above done research it was determined that the optimal distance between drainage-waste canals and additional closed drain-collectors for the Danube RIS equals 100 m. This distance between drains in comparison to existing 200-500 m, provides creation and sustentation on the rice field flushing water mode (regime) with optimal vertical filtration intensity of 6-10mm/d/n. Conclusions. It was proved that using systemic optimization gives us possibility to consequent justification of optimal parameters of varied mode (regime), technological and constructive decisions in their relation to current economic and ecological demands in building projects and reconstruction of RIS. 1. Rokochynskyy A.M. Naukovі ta praktychnі aspekty optymіzacіyi vodoregulyuvannya osushuvanyh zemel na ekologo-ekonomіchnyh zasadah. : monografіya / Za red. akad. UAAN Romaschenka M.І. Rіvne: NUVGP, 2010. 351 s.
2. Rokochynskyy A.N. Systemnaya optymyzacyya vodoregulyrovanyya na melyoryrovannyh zemlyah. // Problemy racyonalnogo yspolzovanyya pryrodnyh resursov y ustoychyvoe razvytye Polesya: sb. dokl. mezhdunar. nauch. konf. (Mynsk, 14-17 sent. 2016 g.). V 2t. T.2 / Nac. akad. nauk Belarusy [y dr.]. Mynsk: Belaruskaya navuka, 2016. S.111-114. 3. Frolenkova N.A., Kozhushko L.F., Rokochynskyy A.M. Ekologo-ekonomіchne ocіnyuvannya v upravlіnnі melіoratyvnymy proektamy: monografіya. Rіvne: NUVGP, 2007. 257 s.
4. Rys v Ukrayinі: monografіya / V.A. Stashuk ta іn. Herson: Grіn D.S., 2014. 976 s.
5. Rys Prydunav`ya: [kolektyvna monografіya] / za red. V.A. Stashuka ta іn. Herson: Grіn D.S., 2016. 620 s.
6. Karuk B.P. Ekologycheskoe obosnovanye proektov melyoratyvnyh system: konspekt lekcyy. Kyev: Yzd. VYPK Mynvodstroya SSSR, 1989. 110 s.
7. Mendus S.P. Obgruntuvannya neobhіdnostі ta posylennya drenovanostі polyvnyh kart rysovyh system (na prykladі Prydunayskyh rysovyh zroshuvalnyh system): avtoref. dys. na zdobuttya nauk. stupenya kand. tehn. nauk: spec. 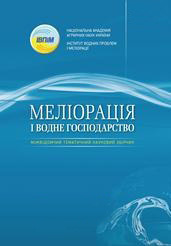 06.01.02 «Sіlskogospodarskі melіoracіyi». Rіvne, 2012. 21 s.
8. Karta- chek rysovoyi systemy z zakrytoyu drenoyu-kolektorom. Pat. na korysnu model № 104000, E 02 V 13/00, 11/00. Ukrayina. 2016. Byul. №1.